Thanks to something called ablaut reduplication — a rule stating that, if you repeat a word and change an internal vowel, the order you say them in has to follow I-A-O. Ever wonder why it’s Little Red Riding Hood? The adjective rule helps you remember what order to put things in: it’s obscure, but yes, it is a thing! ie: little green men, not green little men; and Big Bad Wolf, not Bad Big Wolf. And… now you know about the crazy things elements of eloquence* that I, as an editor, know, to help make your manuscript better! #knowledgeispower #research #grammar #saywhat? *Editor’s Note- The “elements of eloquence” is a great book by Mark Forsyth! Get it and enjoy learning how to turn a phrase. In 1104, in the village of Little Dunmow, England a tradition started called Flitch Day. Today the event is celebrated every 4 years (next one 2020). On this day, a flitch of bacon (half a pig) is awarded to a married couple who can convince a mock jury that they do not regret their marriage. In front of a jury of bachelors and maidens they had to take a pledge. Here’s the pledge the couple had to take. As when you join’d hands in the quire. Though the pleasure be ours, the bacon’s your own. I just finished editing the second novel in the Bayou Talents series for Edward Branley, Trusted Talents. As I am wont to do after finishing edits, I take stock on how I can help my clients streamline the process and make it smoother. Trusted Talents has so *many* characters, I decided to try to create a spreadsheet to keep track of who they are, how they fit in the story, their quirks, their nicknames, and any other details that I think would be important, especially NAME CHANGES in the middle of the story. Well, that got me down a rabbit hole pulling my hair out and drinking lots of coffee late at night (does no good for me when my HS Sophomore needs to be at zero period at 6:45 am and I get up at 5:15 am). I am not an Excel expert by any means, I can do basic sum functions and that’s about it. So, cut to the next morning when I was more awake and able to focus. I used my Google-fu powers and found a few different Excel spreadsheets that did what I was looking for already and all I had to do was test them out and see if it worked well for me. The one I wound up liking and using is from Iulian Ionescu of Fantasy Scroll’s “Master Outlining and Tracking Tool for Novels (MOTT) “. I started with the tab labeled ‘Character List’ and page one of the Trusted Talents novel from Edward. I input all the characters and the formulas that are built into the pages (Remember that I am NO Excel expert) was a lovely touch to make the spreadsheet fill out faster. A couple things that I really liked was when I sorted by first name, you could see that there are way too many names starting with a certain letter, and how many characters have names that are similar (Davey, David). I sent what I had worked on to Edward, to see what he thought, and he realized that Brooks Stirling Sumner (Silver)’s grandfather had two names in the novel. Remember up there when I said NAME CHANGES in the middle of the book? He was listed as both Robert Duncan Sumner and Grantland Sumner. Now, I think of myself as being very attuned to that, but I admit even I missed that name change. This set-up made it easier to fix and find the mistake with a global search and replace function in the master document. I have started on Edward’s newest novel, Dragon’s Defiance (Book 3 in the Blood-Bound Series) and from first read, had a new spreadsheet set up to start on page 1. What a difference this will make in my editing, and my clients writings. I highly recommend this. I’ve only used the Character List tab at this time, but I can see how much more you could do with this spreadsheet – from the Character Genealogy Tab (one of my other passions on the side), to the Word Count Tracker (great for authors trying to hit a certain word count per day or per week to finish their novel), and the Scene List. In the updated Version 2.0, which I just downloaded, there is the Cards Tab (sort of my old way of writing papers in high school and college with index cards delineating all the scenes/main ideas.) This one is automated, so if you use the Scene List, it pulls the information from that. The Chapters Tab in Version 2.0 will give you a visual graph of how word count length and number of scenes per chapter. I’m a firm believer if you have various tools and processes in place, it helps you focus on what you need to do, which is write! (Or in my case, EDIT!) Don’t be afraid to use tools that are already out there to make your process easier. One does not have to reinvent the wheel. You can tweak something that is created to match what you need. Until next time… Don’t fear the red pen! Why is there an apostrophe in Hallowe’en? One early spelling of “Halloween” was “All Hallows’ Even (Even = evening). The “all” and “s” were dropped, “hallows’ ” and “even” became a closed compound, and the apostrophe took the place of the “v,” giving us “Hallowe’en”—just one of many transitional spellings along the way to “Halloween,” which the Oxford English Dictionary shows as first appearing in 1786. It originated with the ancient Celtic festival of Samhain, when people would light bonfires and wear costumes to ward off ghosts. In the eighth century, Pope Gregory III designated November 1 as a time to honor all saints; soon, All Saints Day incorporated some of the traditions of Samhain. This day marked the end of summer and the harvest and the beginning of the dark, cold winter, a time of year that was often associated with human death. Celts believed that on the night before the new year, the boundary between the worlds of the living and the dead became blurred. On the night of October 31 they celebrated Samhain, when it was believed that the ghosts of the dead returned to earth. Posted in Around Town, Did You Know ? You may be saying, okay, the Book Doctor needs Coffee (you’d be right!). What is she talking about, and what does a manhole cover and hotel have to do with New Orleans? I was doing some research for a GoNOLA article coming out on the New Orleans Public Service Inc (NOPSI) history and the current iteration of the NOPSI hotel that opened in June 2017. A couple of tidbits caught my eye, and since the GoNOLA article is more tourism-based than deep research, I had to post the extras of what I found here. Back before full electricity, there was a city ordinance in New Orleans that everyone had to carry lanterns. Gas Lighting came to New Orleans in 1824 with James Caldwell and the American Theater. Centrally located near the French Quarter and the Warehouse District, the 1920s-Jazz era NOPSI building that was tantamount for your electricity, transportation, and streetcar headquarters has been renovated to the NOPSI hotel at 317 Baronne Street. The building is listed on the National Register of Historic Places since 1971, and was declared a historic landmark by the Historic District Landmarks Commission in 2011. The hotel has aesthetic lines that are reminiscent of days past, with the building’s street facades, cast iron rails, and stone panels. The lobby counters are where the customers used to pay their bills. And, coming full circle (Ed Note: ha!) the circular logo of the hotel is inspired by the manhole covers (look down) on the streets of Crescent City. Posted in Did You Know ? The shortest and longest inaugural addresses were given by George Washington and William Henry Harrison, respectively. Washington’s second inaugural address was only 135 words long. William Henry Harrison’s inaugural address was 8,445 words long. Harrison spoke for one hour and 45 minutes in a snowstorm without a coat. William Henry Harrison also served the shortest presidency. He died of pneumonia a month after his inauguration in 1841. The Oath of Office is traditionally administered by the Chief Justice of the Supreme Court, though not required. There is also no requirement that it occur in Washington, D.C., or that the president place his hand on the Bible. The only thing prescribed by the Constitution is that the president take the Oath of Office. In 1937, Franklin D. Roosevelt became the first president to be inaugurated on January 20. Previous presidents (including FDR for his first term) had traditionally been inaugurated on March 4, but the 20th Amendment, passed in 1933, stipulated a January 20 inauguration. A total of four March inauguration dates fell on a Sunday (1821, 1849, 1877, 1917); the swearing-in ceremonies in these cases were all postponed until the next day. Three January inauguration dates have fallen on a Sunday: 1957 (Dwight D. Eisenhower), 1985 (Ronald Reagan), and 2013 (Barack Obama); these three presidents were sworn in privately on the 20th and then a public ceremony was held the next day. If you ever wandered up into the attic to look at your grandparent’s old books, or through a used bookstore perusing the shelves, you know that smell. 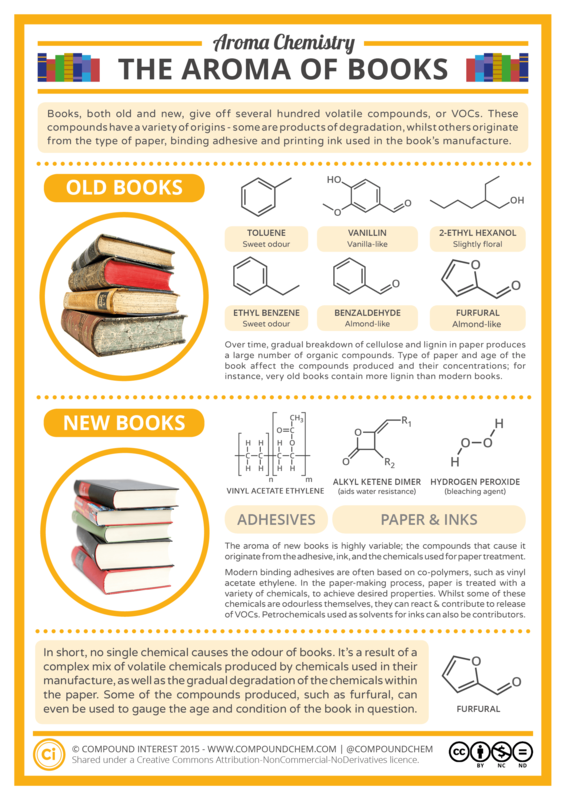 When you open one of the tomes and flip through the pages, did you ever wonder what causes that “Old Book Smell“? It is sort of a hint of vanilla, maybe a little grassy smell, with some mustiness? Lignin, the stuff that prevents all trees from adopting the weeping habit, is a polymer made up of units that are closely related to vanillin. When made into paper and stored for years, it breaks down and smells good. Which is how divine providence has arranged for second hand bookstores to smell like good quality vanilla absolute, subliminally stoking a hunger for knowledge in all of us. There are two perfumes to a book. If a book is new, it smells great. If a book is old, it smells even better. It smells like ancient Egypt. A book has got to smell. You have to hold it in your hands and pray to it. You put it in your pocket and you walk with it. And it stays with you forever. I immediately felt a sense of nostalgia that I haven’t felt in a long time. The scent of physical books—the paper, the ink, the glue—can conjure up memories of a summer day spent reading on a beach, a fall afternoon in a coffee shop, or an overstuffed chair by a fireplace as rain patters on a windowsill. Be sure to check out The New York Times [LENS] which has a beautiful slideshow of old, discarded books. The International League of Antiquarian Booksellers’ Is It More Than Old Book Smell? Note:Old book bindings at the Merton College library, photo by Tom Murphy VII distributed under a CC BY-NC-SA 4.0 license. Ancient history states that in Ireland, St Brigid of Kildare complained to St Patrick that women waited too long to have men propose to them. St Patrick deemed February 29th (leap day) every four years the one day a woman could propose to a man. acknowledging perhaps you don’t know what that is. The girls take the part which gentlemen usually take … The boys all sat round the room, the girls didn’t sit down and when a cotillion was announced they walked up to the boys and asked if they might have the pleasure of dancing with them and offered their arms, which the boys took and walk out. After the dance they promenaded leaning on the girls’ arms and being fanned. It was very funny and they all had a rousing time. This quote is taken from Katherine Parkin’s article “‘Glittering Mockery’: Twentieth-Century Leap Year Marriage Proposals” in the Journal of Family History January 2012 volume 37 no. 1, pages 85-104. This is probably the start of the Sadie Hawkins Dance. Mental Floss tells us that it came from the mind of Al Capp, cartoonist for the Li’l Abner comics, on November 15, 1937. Vintage advertisements and trade cards showcased the Leap Year marriage proposal and chase, as well. Slate magazine illustrated this idea of women proposing to men for Leap Year with postcards from the 1900s. The 366th day of the year, arriving once every four years based on the Gregorian calendar. Unless the year is evenly divisible by 100 and not evenly divisible by 400. Let the Daily morning Astorian (Astoria, OR.) explain on February 28, 1884. Happy Leap Year ! See you in Four Years!